The Kingdom Hotel Victoria Falls was built in 1999. This architectural masterpiece is designed in the style of The Great Zimbabwe Ruins. The design and bright African themed décor makes for a great atmosphere and authentic feel. 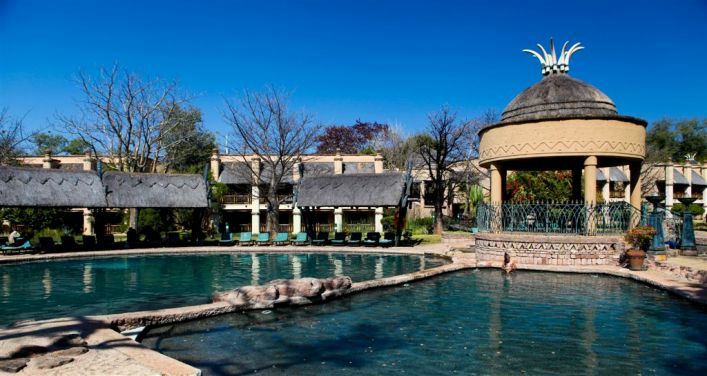 It is one of the closest hotels to the Victoria Falls being a short five minute walk away down a private path from the hotel. Please note that this path goes through part of the Victoria Falls National Park, which is not bound by any barriers. Therefore, wildlife roam freely in the area and you may encounter warthogs, elephants, kudu, and sometimes (though rarely) even lion. We encourage you to keep your distance and have respect for these wild animals. The accommodation at the Kingdom is extremely well priced for this area and is good value for money. It is one of our recommended hotels. 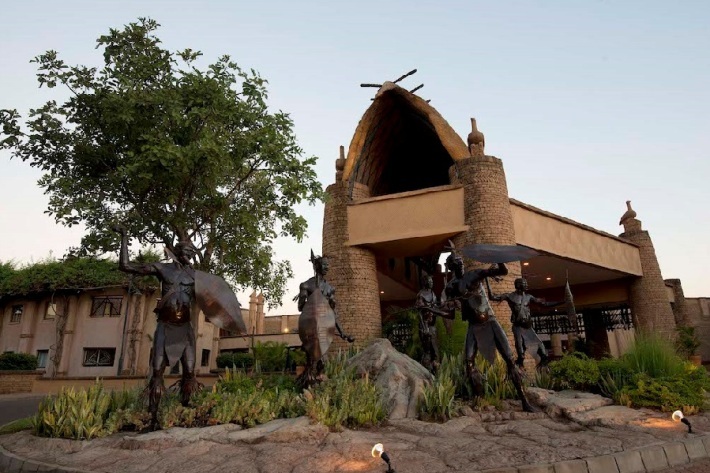 The design of the Kingdom Hotel Victoria Falls has taken into account the needs of families, groups, conferences and holiday makers wanting a fun, resort style hotel. The Kingdom Hotel Victoria Falls also has a beautiful pool area with two swimming pools, a pool terrace with one of the resort’s many bars. A great deal of attention has been paid to the smaller details such as the cast iron ‘seed-pod’ bar and the hand sculpted statues on the lawn – all adding to that ‘magical kingdom’ effect. The hotel has 294 rooms which are situated in separate two and three storey units, built around the large water feature lake. 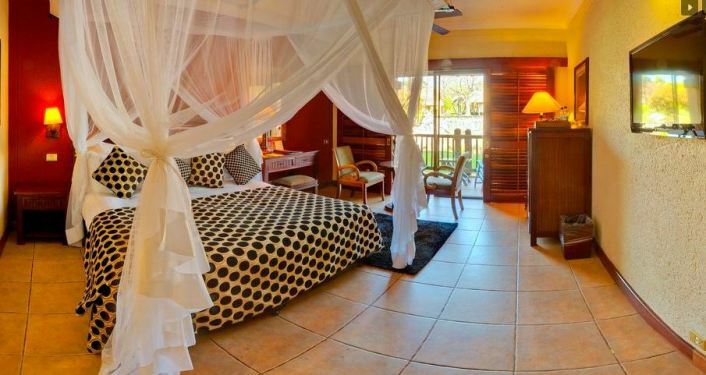 The rooms are bright and spacious and decorated to match the African theme. The newer wing called the Kings Club is a refurbished section of the hotel, but offers more services to guests. Additions such as complimentary airport transfers, a personal hostess throughout your stay, a bottle of wine and complimentary hand massage, gives an extra special experience as a guest of the Kings Club. All the rooms have balconies and some of them overlook the lake, while the others overlook the property's gardens. Many of the rooms have extra bunk beds for families and there are two twin bedded paraplegic rooms. 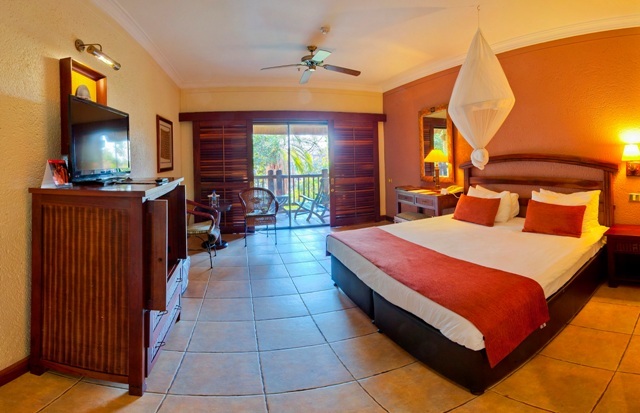 There are also four suites each with a separate lounge and extra bedroom, as well as a mini bar. The Kingdom Hotel Victoria Falls also has elevators and ramps to assist guests with special needs. Kingdom Hotel is a large family friendly hotel located only five minutes walk from the Falls. For the mid-range hotels this would be our favourite choice. It has interesting architecture and great pool area which is ideal for families. The hotel food is not great and is expensive so try not to go for an all inclusive deal which includes meals, rather eat out at some of the other restaurants in town or the hotel food court. It has a casino onsite which appeals to some guests although it is small and not that vibrant. 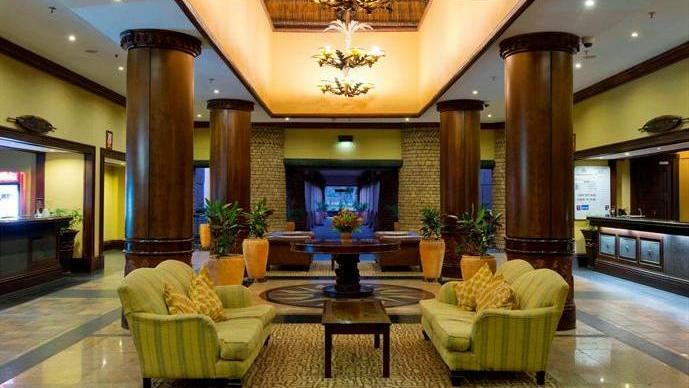 For this price range you can't go wrong staying at the Kingdom Hotel Victoria Falls. • White Water - Is the main hotel restaurant which seats 240 people. This restaurant and its terrace overlook the Pool Island and the panorama of surrounding rooms. It is open for a buffet breakfast and dinner. • The Great Enclosure - This entertainment complex is popular with both tourist and locals. It hosts two bars, a food court and of course the Makasa Casino, which are all detailed individually below. • Wild Thing - is an action bar with live entertainment and a big TV screen – very popular with the young at heart and the locals. • Big Chief Steak & Grill - is situated in The Great Enclosure and is a relaxed and informal family steakhouse serving a selection of grilled steaks and seafood, pizza and burgers. Children are made welcome with lots of fun activities to keep them occupied. 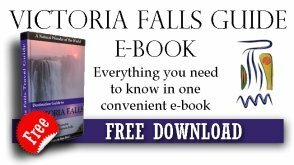 • Self-drive to Victoria Falls and turn right after the Total Garage. The hotel will be on your left. • Fly in to Victoria Falls Airport (21 kms) or Livingstone Airport (19 kms + 1 border crossing), then transfer to Kingdom Hotel.